Act I: in a medieval village in Rhineland the gamekeeper Hilarion is deeply in love with Giselle and just as jealous of Loys, who is really the Duke Albrecht disguised as a peasant. Loys comes to meet Giselle after hiding his sword and sending his equerry away. When Giselle comes out of her house she is courted by Loys. Giselle then plucks the petals from a flower and gets a "he loves me not" answer, but Loys promises eternal love to her. Then Hilarion enters the scene and swears his love for Giselle. He, however, is scorned by Giselle and chased away by Loys and leaves promising revenge. The village people come out and there is music and dancing. Giselle joins in the dancing despite her mother's fears against it because many girls have died after dancing on their wedding night and become wilis, white phantoms who haunt the woods by moonlight. At this point in the party the Prince of Kurland and his daughter Bathilde, who are returning from the hunt, stop in the village. Giselle and the Princess Bathilde dance, and the princess gives Giselle a necklace before leaving. Meanwhile, Albrecht/Loys has been conveniently away. When Albrecht/Loys returns Hilarion unmasks Albrecht, breaking his disguise by showing Albrecht's sword, which he has found. He then sounds his horn to recall the nobles. When they arrive, Albrecht takes the princess,' (to whom he is betrothed), arm, ignores the presence of Giselle, and says that he was simply diverting himself in the country dances. Giselle, crushed by this, goes mad and in her frenzy grabs Albrecht's sword and kills herself with it, falling dead into her mother's arms in front of an astonished and despairing Albrecht. Act II: It is midnight by Giselle's grave in the woods. Hilarion wanders by, mortally afraid. Myrtha, the Queen of the Wilis appears and scatters the petals of every white flower in the woods with a twig, thus calling the rest of the wilis, who arrive to welcome their new companion, Giselle. The wilis hear human footsteps approaching and quickly vanish in the woods, leaving Giselle hovering above her grave. It is Albrecht, who is mourning Giselle, whom he learned to love too late. He places some lilies on her grave, then suddenly sees the hovering Giselle, whom he follows into the woods. The wilis return and Hilarion wanders back on stage. He is immediately surrounded by the wilis who force him to dance until he drops dead of exhaustion. Then Albrecht returns and is condemned to the same fate as Hilarion and all of those who encounter the wilis. Giselle, however, protects him and begs the Queen for mercy, in vain. Albrecht dances, sustained by Giselle's love until the first light of dawn chases the wilis into the woods, and survives. One of the most popular ballets of all time this ballet is being performed somewhere by someone almost all the time, and has boasted all of the best dancers in its leading roles since its creation. 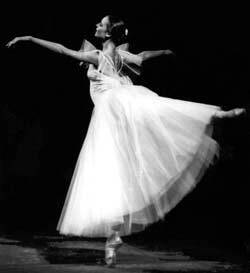 It is in Giselle that Petipa, (who did some work on the original choreography), created the ballet-blanc, or corps of women, in white, that has become a symbol of classical ballet.